Paul never wanted the Speaker job because he knew he would be exposed for taking positions that go against the party, conservatives and not fight for the people but instead for special interests. Ryan could order a special commission to blow this whole Russia-TrumpDNC-Clinton thing out of the water if he wanted to. Instead he does nothing, he doesn’t even stand with Congressional committees who have oversight power over the very govt agencies refusing to produce documents and information they’re entitled access to. It’s no wonder Gaetz says he “was hearing colleagues say, ‘Well if Speaker Ryan won’t stand with us in this fight over the essentials of our democracy, not weaponizing the intelligence community against a presidential campaign, do we need to look at other choices? 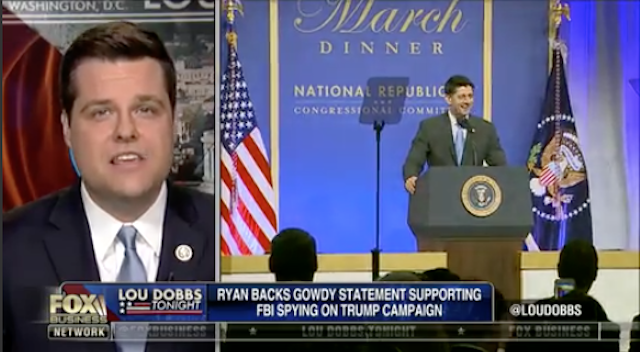 '” Ryan’s name can be added to the long list of people getting in the way of getting to the bottom of corruption, spying and abuse of power used against Pres Trump. As stated here, Ryan (and McConnell) is a cancer to Pres Trump’s presidency. Those in Congress tired of Ryan’s games should hold a vote of no confidence to oust him. Ryan is done in Congress this year anyway, in the few mos left we could get someone competent in as Speaker who can get things rolling as far as commission, possible impeachment of DOJ officials etc before the midterms and 2019.